Published: Jun 25, 2015 to ? Mahou Shoujo Tokushusen Asuka has been published in English as Magical Girl Special Ops Asuka by Seven Seas Entertainment since November 28, 2017. 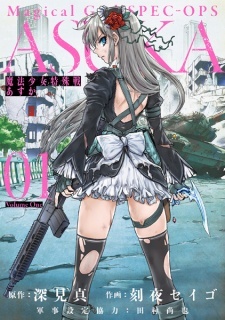 Mahou Shoujo Spec-Ops Asuka is story about highschooler Asuka who is trying to fit in everyday life after taking part in military before. She is strongly against joining military again, but as the story progresses she realizes she doesn´t have much of a choice. The art is outstanding, very clean and clear, so the reader knows immediately what is going on. As a bonus, every volume begins with color pages. Characters are strong individuals with interesting personalities. The story focuses not only on Asuka, but also on other magical girls and characters. It is easy to choose your favourite and also the most repulsive character. As for enjoyment and overal feelings I give Asuka 8/10, mostly for the reasons I can´t write here since I would spoil the story. The story itself might be a little complicated if one is not familiar with Japan military services. But that´s not degrading its value. My review is preliminary, but as soon as I get to the new chapters in EN, I might add further details. But I recommend it to everyone who likes for example Madoka and dark stories involving magic.